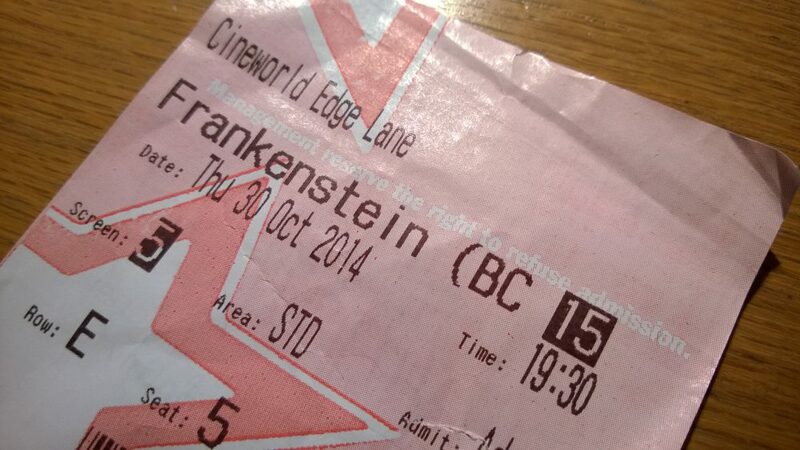 A ticket for a National Theatre live production of Frankenstein with Benedict Cumberbatch and Jonny Lee Miller. Photo courtesy of Pete/Flickr. As an American arts journalist living in London, I have always appreciated what a luxury it is to have access to a repertory company whose government funding means I can go to stellar productions at reasonable ticket prices. But since it is funded by taxpayers from all over Britain, the National Theatre also has had a challenge: how to be truly national, accessible to audiences around the United Kingdom, not just those within easy reach of its base in the capital. The NT has amply repaid the public’s investment with financial blockbusters (and artistic landmarks) such as War Horse, The Curious Incident of the Dog in the Night-Time, The History Boys, and One Man, Two Guvnors. Its productions range from canon stalwarts like Shakespeare and Ibsen to collaborations with groundbreaking experimental companies like Complicité, Kneehigh, and DV8. It’s also where, thanks to long-standing relationships, theatrical luminaries like Tom Stoppard, Alan Bennett, David Hare, and Mike Leigh premiere their latest works. And thanks to state-funded subsidies (which are generous by U.S. standards, but subject to considerable cutting depending on the government of the day), top prices for productions on the two mainstages hover around £65, or $103. An ongoing sponsorship arrangement with Travelex means selected productions offer a limited number of £15 tickets. There has also been outreach to new audiences both in terms of non-traditional casting and in commissioning new works by playwrights from diverse backgrounds. But the NT’s most successful scheme for broadening its audience has been the NT Live simulcast. 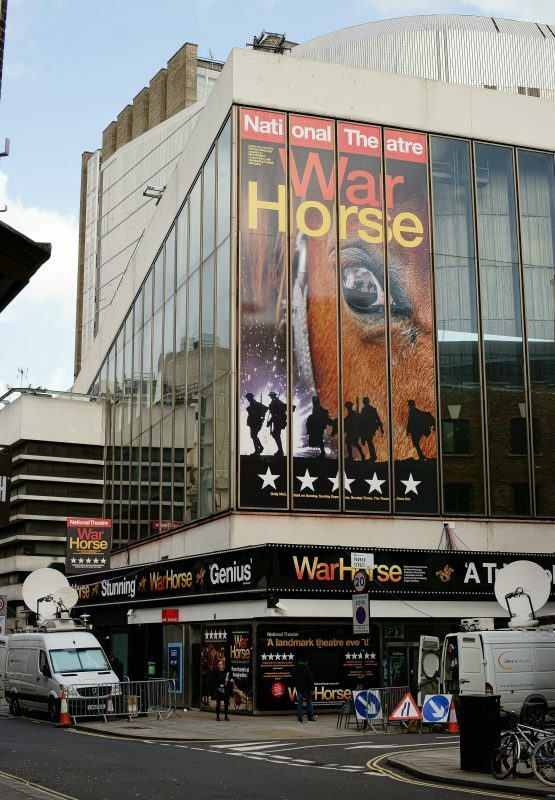 The National Theatre’s production of War Horse was one of those broadcast to cinemas around the world. Photo courtesy of Peter Trimming/Flickr. NT Live began in 2009, the brainchild of then-artistic director Nicholas Hytner, who started with a screening of Racine’s Phèdre starring Helen Mirren that was beamed live-by-satellite to some 50 UK cinemas, where it was seen by approximately 50,000 people. It wasn’t an entirely new concept, of course. As long ago as 1964, a performance of a modern-dress Hamlet directed by John Gielgud with Richard Burton in the title role was filmed during its run at Broadway’s Lunt-Fontanne theater and distributed to movie theaters, but the visual quality left something to be desired. The as-live performance concept was truly pioneered by the Metropolitan Opera—which began simulcasts in 2006 (by 2008 more people had seen the Met in a movie theater than in the opera house). The Met inspired other arts institutions like La Scala, The Royal Opera, The Royal Ballet, The Bolshoi Ballet, and the Los Angeles Philharmonic (which started a simulcast program in 2011 but sadly had to cancel it two seasons later) to follow in their footsteps. It was in fact a Met cinema simulcast that convinced the National Theatre top brass the concept would work, although they still had their doubts whether an art form that didn’t involve music would be equally successful. To avoid a static, overly-stagey feel while maintaining the immediacy of the theatrical experience, the NT Live broadcasts are multi-camera shoots in front of a live audience. Two fixed cameras, two tracking cameras, a crane and a Steadicam plus 16 microphones are positioned carefully throughout the auditorium, so the screen audience, as they would in person, looks at the stage from different angles (with guaranteed excellent sightlines). To create a fully-integrated experience, the camera script is devised in tandem with stage rehearsals. Sound levels, makeup, and even wigs (built-to-last theater wigs can look artificially stiff on camera) are tweaked. For all its successes, Britain’s National Theatre has been acutely aware of the need to expand audiences beyond its middle-class base. Its most successful scheme for broadening its audience has been the NT Live simulcast. The international expansion initially focused on English-speaking territories, but screenings are now offered with local language subtitles in almost 10 languages. And while venues initially were limited to arthouse and independent cinemas, the roster has grown to include multiplex screens. Ticket prices are set by the venues themselves, with pricing seeking a balance between the cost of a local cinema ticket and the cost of a live ticket for the same production. UK NT Live prices are currently around £20. While recent live television broadcasts in the United States have tended toward family-friendly musicals like Hairspray and Newsies, the National is dedicated to providing more serious, challenging fare as well as the crowd-pleasers, new plays as well as war horses (or indeed War Horse). Hytner declared that, “Playing dangerous, keeping grit always in the oyster, seems to me absolutely essential,” so productions have ranged from Coriolanus, Hedda Gabler, and Yerma to Peter Pan and Amadeus. The biggest draws have usually involved some element of star power, whether Jonny Lee Miller and Benedict Cumberbatch in Frankenstein, Ralph Fiennes in George Bernard Shaw’s Man and Superman, or Nathan Lane and Andrew Garfield in Tony Kushner’s Angels in America. As early as 2011, when it broadcast Complicité’s A Disappearing Number from the Theatre Royal Plymouth in the south of England, the NT partnered with other theater companies and regional theaters. Co-productions have included A Streetcar Named Desire starring Gillian Anderson from the Young Vic and Les Liaisons Dangereuses starring Dominic West and Janet McTeer from the Donmar Warehouse. NT Live’s biggest single broadcast to date, seen by more than 550,000 people, was Hamlet with Benedict Cumberbatch, a Barbican Theatre production. It even occasionally ventures into the commercial theater, broadcasting Peter Morgan’s The Audience and Martin McDonagh’s Hangmen from the West End, London’s equivalent of Broadway. Fears that the digital broadcasts would reduce the incentive to see live performances proved unfounded. Research commissioned by Arts Council England showed that more people are likely to visit their local theater after seeing an NT Live screening. The success of NT Live has shown that digital technology need not drain audiences from live theater but, harnessed properly, can enhance them. Formerly a theater critic for the San Francisco Chronicle, Ellin Stein has written on arts and culture for publications including The New York Times, The [London] Times, The Telegraph, and Slate, and is the author of That's Not Funny, That's Sick: The National Lampoon and the Comedy Insurgents Who Captured the Mainstream (Norton, 2013).